Information technology (IT) stocks, which had underperformed the broader markets until mid-September, are now back in favour. Since 12 September, the CNX IT index of the National Stock Exchange has outperformed the benchmark Nifty by nearly 20%, more than making up for its underperformance earlier in the year. According to an analyst with a foreign brokerage firm, every ₹ 1 increase in the rupee to dollar rate leads to an increase of around 3.5% in earnings for Infosys Ltd. The increase in earnings will be lower for firms such as Tata Consultancy Services Ltd, since they have hedged to a much higher extent. Even if one were to assume that the rupee to dollar rate in the medium term will average 50, this will lead to an over 20% increase in earnings estimates for Infosys compared with August. 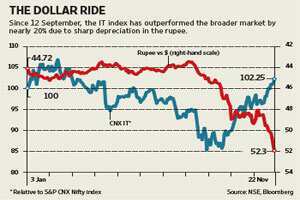 Mint’s Mobis Philipose says the fall in the value of the rupee has provided some relief to many Indian IT companies struggling for other reasons. Besides, the sharp rise in the rupee will provide a large margin buffer for IT companies, which will not only offset the pressure of wage inflation, but also companies’ leeway to spend more on sales and marketing to generate demand. This is a welcome relief for companies in the sector as well as investors. In fact, a number of importer firms as well as companies with unhedged foreign currency borrowings are reeling under the pressure of a falling rupee. Given the widening trade deficit and the drop in portfolio and capital flows into the country, the fall in the rupee is expected to continue. In this backdrop, IT stocks may continue to outperform the broader markets. Of course, the rise will be limited, given the weakening global macroeconomic situation. Infosys’ chief financial officer said on Monday that the company may miss the upper-end of its sales target for the December quarter and the fiscal year because of a deterioration in the global economic environment. Even so, IT firms seem much better placed compared with firms catering to the domestic economy, which are grappling with high inflation, high interest rates as well as the impact of a declining rupee on their imports and borrowings.